The Largest Star in the Universe: What Size is It? But instrumentation measurements have made it possible to identify the stars distance, luminosity, magnitude, size, and mass, and speed or rotation. As we walk through the collection, keep in mind that we will be comparing the size of the star in question with our Sun. The Sun is a star. It burns hydrogen and helium in a nuclear furnace that produces the light and heat that we recognize and depend on for our survival, for all life on earth's survival. The Sun's diameter is 865,000 miles, while the Earth's it 7,918. In other words the Sun is 109 times bigger than the Earth. Another way of looking at this is that you could fit about 1.3 million Earth's in the Sun. 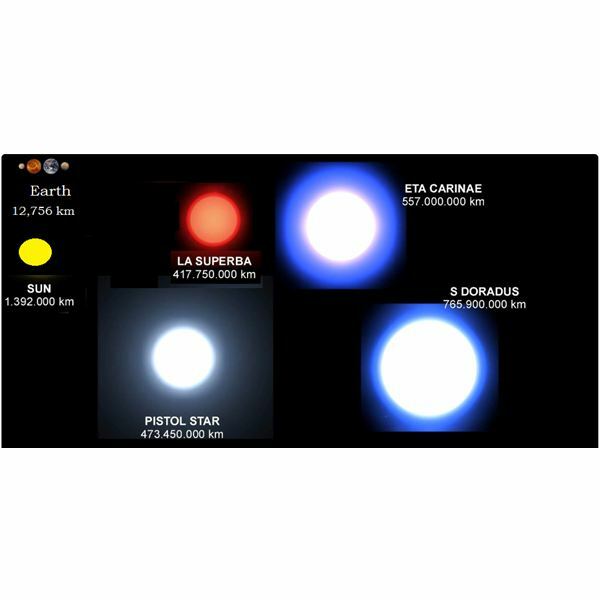 The Star Sirus is just under twice the size of the Sun. Sirius is also known as the "Dog Star", because it is in the constellation, Canis Major. It is the brightest object in the sky. It is almost twice the size of the Sun. 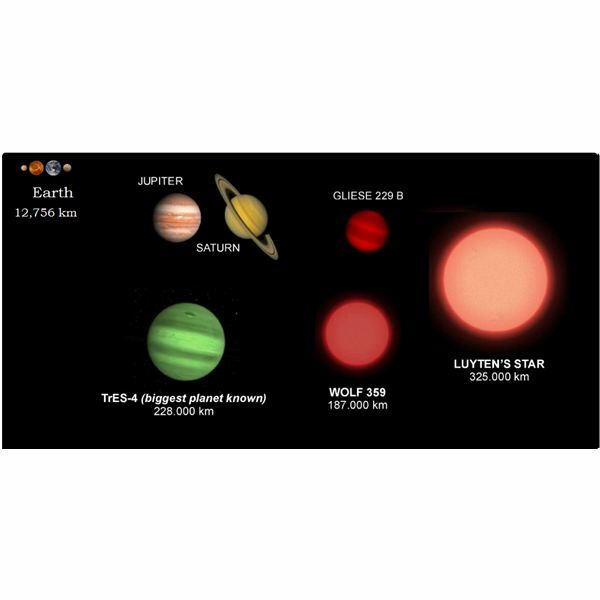 Luyten's Star is a red dwarf star in the constellation Canis Minor and it is about 12.36 light-years from the Sun.It is about 153,000 km.in size; it is much smaller than the Sun. Alpha-Centauri A and B are binary stars that are about 4.37 light years from the sun. They are close in size to the Sun; although one is slightly larger and the other slightly smaller. Spica is the brightest star in the constellation Virgo located 260 light years distant from Earth. 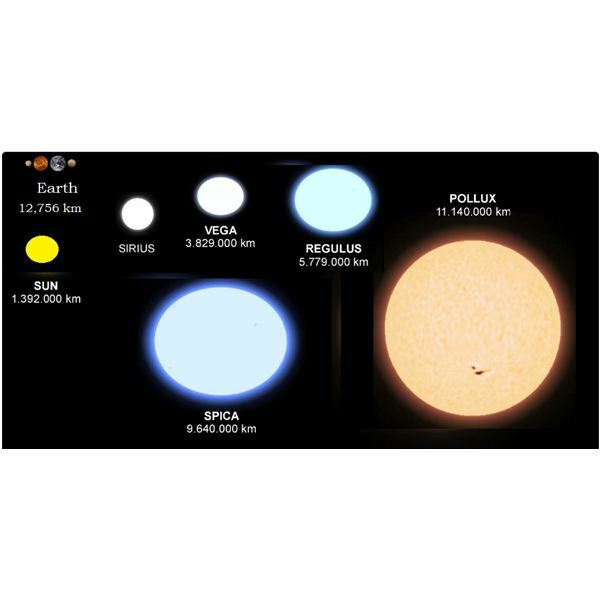 It is a blue giant, and it is about seven times larger than the Sun. Up until now, the astronomical sizes have been, well shall we say, manageable? Compared to the Earth, all stars seem big. But the Sun was well in the neighborhood of size. It wasn't the little kid in the block. Well, it's not that way now. The star sizes truly become large, in a gargantuan dimension. Two blue giants.Alnitak and Rigel fit the bill here. Alnitak is a triple star system laying at the eastern end of Orion's belt. It is about 800 light years from the Sun. It is 28 times more massive than the Sun and about 60 times larger. Rigel is 70 times larger than the Sun.It is in the Orion Constellation. It is a binary star system. The size of the stars hereafter are truly astounding. True they are large especially as we saw with the Blue Giants. But Now we are entering into a much different area of size. These stars simply dwarf what has come before. Many of these stars are hundreds of times larger than the Sun. One of the interesting facts about the hypergiants is their lifetime. They have very high masses but their lifetimes are very short in astronomical timescales, meaning that they only exist for a few million years compared to the several billion years for stars like the Sun. This in turn explains why it is hard to find hypergiants; they are extremely rare and only a few are known today. Even larger stars are discussed on page 2. 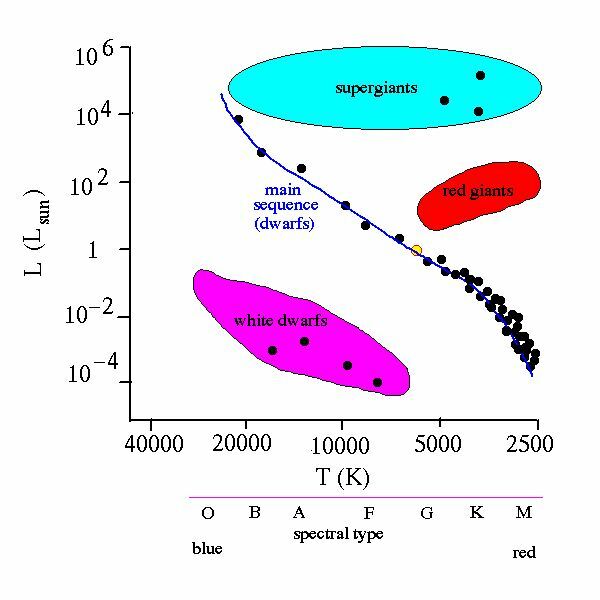 Where are the Largest Stars in The Hertzsprung-Russell Diagram? One of the easiest and best ways to understand the evolution of stars is by looking at the Hertzsprung-Russell Diagram. This diagram shows where the stars are likely to fall as they appear over time. It measures the luminosity and temperature of a star. It shows that the vast majority of stars will fall in the area known as the main sequence. But as you can see, outside of the main-sequence, you have the area for the Super Giants and the Red Giants. The Blue Giants mentioned before were big, but LA SUPERBA dwarfs them. 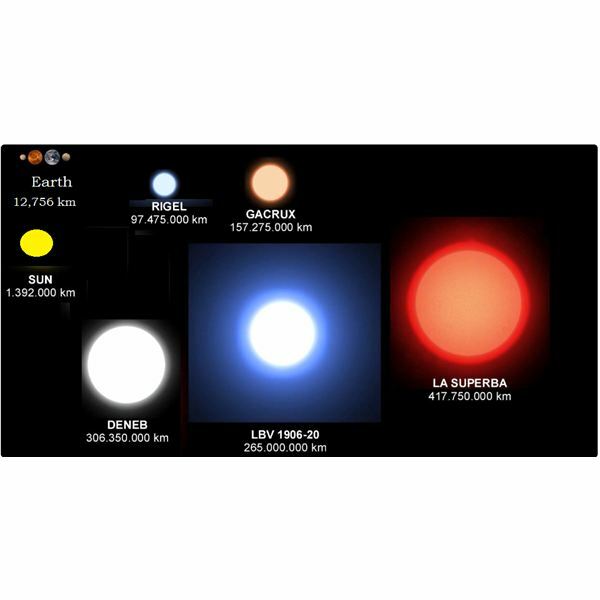 La Superba is a Red Giant with a radius of approximately 2 Astronomical Units. This means that If it were placed at the position of our Sun, the star's surface would extend beyond the orbit of Mars. But this Red Giant is still much smaller than S Doradus. S Doradus is the brightest star in the Large Magellanic Cloud, a galaxy next to the Milky Way. It is a hypergiant that is 550 times larger than the Sun. 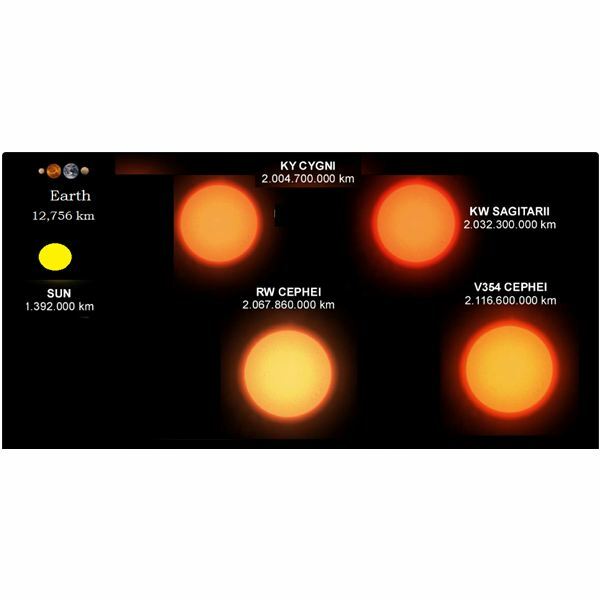 KY Cygni is a red supergiant star located in the constellation Cygnus. It is about 1,440 times the Sun's diameter and it is approximately 5,200 light-years away. V354 Cephei is a red hypergiant star within the Milky Way. It is about 9,000 light-years away from the Sun It is about 1520 times larger than of the Sun. If it were in the position of the Sun, its outer surface would reach between the orbits of Jupiter and Saturn. It is about 9,000 light years away. WOH G64 is a red hypergiant in the Large Magellanic Cloud. It is about 2000 times the radius of the Sun; it is one of the largest known stars. Our Star Trek has taken us from the (relatively) small size of the Sun to nearby galaxies larger and larger stars. 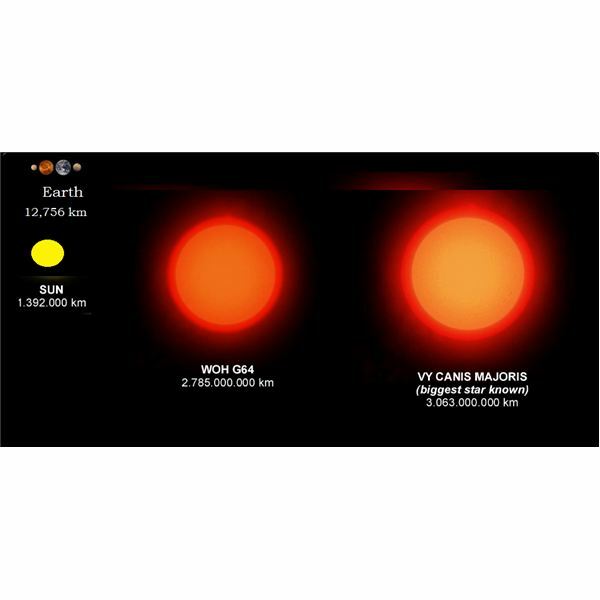 Our journey through the heavens has finally lead us to the largest known star, VY Canis Majoris located in the constellation Canis Major. This star is 2200 times larger than our Sun. It is a red hypergiant star, and it is about 4,900 light years away from the Sun. Is there an upper limit to how big a star can get? The current theories suggest that the upper limit is 150 solar masses, but this refers to the mass of a star. Beyond that astronomers have not been able to find any stars that have more mass. On a different note, astronomers have observed that the largest stars are the coolest. Eta Carinae, for example, is the most luminous star that is known and it has an extremely hot temperature of 25,000 degrees Kelvin, yet it is only 400 solar radii. The largest stars happen to be the cool super giants. 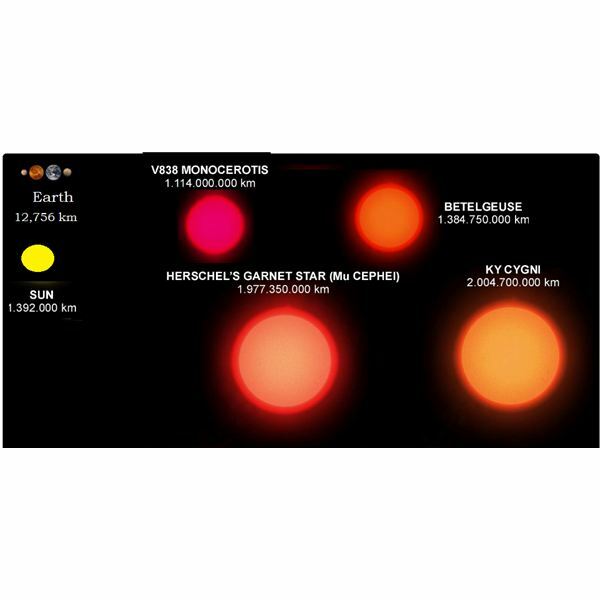 VY Canis Majoris is only 3,500 degrees Kelvin and it is 2200 times larger than the Sun. Bigger stars would be even cooler. We walked through the collection of the largest stars beginning with an introduction to the Sun. Our trek has shown that many stars are indeed larger then the Sun, but they begin to fall away from the main sequence of star orientation. 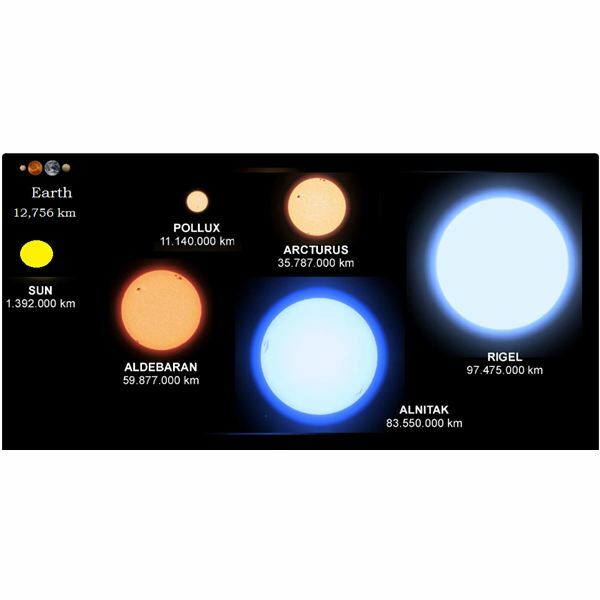 The very largest red and blue and the super and hyper giants are special because there are so few of them when compared to the regular main-sequence stars. 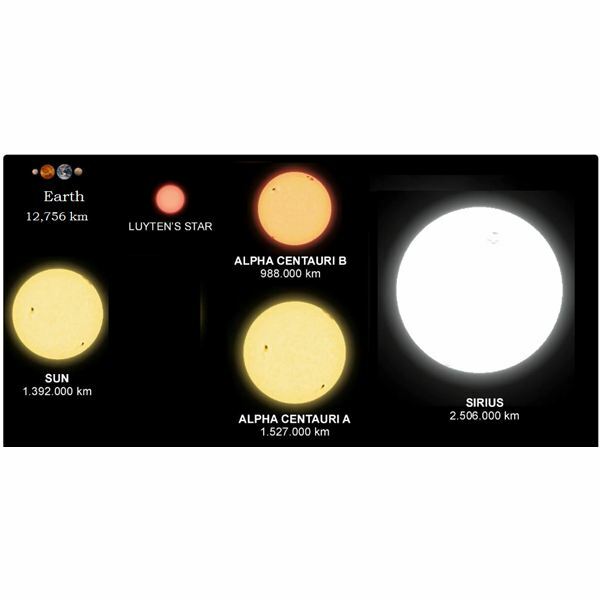 The largest known star to date is VY Canis Majoris and it is a cool super giant. In fact, the biggest stars known are the cool super giants. In this series of articles we discuss how stars form, the various kinds, and how they lead up to galaxy formation. We also look for the largest known star in the visible universe. What is the Largest Known Star in the Universe?